If you need a short-term system, a specialized language, or monitoring anywhere you go, the Philips Lifeline medical alert system may be the right fit. However, the high monthly costs and additional fees keep it off our top recommendation list. 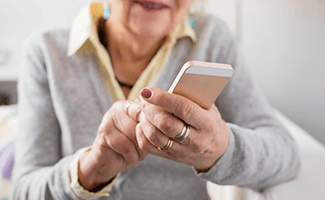 While it’s impossible to be with our parents or grandparents all the time, an emergency medical alert system can make sure our loved ones at risk of falling will be taken care of in case of an emergency. One such system is Philips Lifeline. While it is not one of our top three best medical alert systems, it has some unique features and advantages that might make it the right fit for your situation. Like other medical alert systems, Philips Lifeline uses an in-home communicator and an emergency help button worn as a waterproof bracelet or necklace-style pendant. You simply push the help button to talk to the response center through the in-home communicator. If the responder can’t hear you, you’ll get a phone call. The in-home communicator base has a decent range of 600 to 800 feet, and though that falls short of the range of our top picks, it should be sufficient for an apartment or smaller home. One customer service rep we talked to recommended doing a range test once the system is installed so you know exactly how far you can go and still use the help button. Philips Lifeline offers two away-from-home monitoring options—one with an in-home base station and one without. These give users and caregivers the comfort of knowing help is available anywhere. Both options use two-way voice communication through the help button pendant when the wearer is away from home. Fall detection is the feature we look for most in a good medical alert system. Philips Lifeline offers its AutoAlert fall detection with most of its packages. AutoAlert uses three methods to detect falls: barometric sensors, accelerometers, and accuracy algorithms. When the sensor detects a fall, it will automatically contact the response center after 30 seconds if you don’t push the help button. Philips Lifeline has a 24/7 response center available. Some medical alert companies operate without a dedicated response center, and having one is a definite plus. The responders will verify that you need help (and that it’s not a false alarm) and then call your listed contacts. They can also dispatch EMTs or police, depending on the situation, and offer assistance in over 140 languages—many of the company’s English-speaking representatives also speak Spanish. This is a uniquely helpful feature if you or an aging family member is more comfortable with a language other than English. One of the things we like best about Philips Lifeline is that it does not require any long-term contracts. All services are charged month-to-month and can be canceled anytime with 30 days’ notice. Most medical alert companies require a year contract, so this is an area where Philips Lifeline stands out from the competition. However, be aware that the lack of contract also means there are no prepayment discounts for paying for the entire year up front. Philips Lifeline’s largest downside is that it is much more expensive than many competing companies. Our top companies have lower package rates and often charge only $5 for fall detection, where Philips Lifeline charges $15 or more. Another downside to Philips Lifeline is that it requires an activation fee for its HomeSafe packages and a device fee for GoSafe products. This is in addition to shipping and installation fees if you choose to have a professional install your system. Many other medical alert companies don’t have these fees, so that makes Philips Lifeline even more expensive than the competition. Philips Lifeline doesn’t charge anything for repairing or replacing defective equipment, though one customer service rep told us that it is determined on a case-by-case basis. However, there is a cost for new equipment if you misplace the old device. The on-the-go pendants come with only a one-year warranty. Price $29.95/mo. * $41.95/mo. $44.95/mo. $56.95/mo. $54.95/mo. $64.95/mo. $44.95/mo. $29.95/mo. * $41.95/mo. $44.95/mo. $56.95/mo. $54.95/mo. $64.95/mo. $44.95/mo. *New customer price subject to change. HomeSafe Standard is Philips Lifeline’s base package. It comes with a landline or wireless in-home communicator with a 30-hour backup battery in case of a power outage. All the base communicators perform automatic self-checks to make sure the system is working. This is the only system with a choice between a wristband or pendant help button (both waterproof). All the other packages use only a pendant, so if a wristband is the most important feature to you, this is the package for you. However, there is no fall detection, so we don’t recommend this package. HomeSafe with AutoAlert is the basic HomeSafe system with one important difference: it comes with AutoAlert fall detection. This means that only pendant-style communicators are offered and the packages are more expensive, but it is worth having that extra protection. As is the case on the HomeSafe Standard, the communicator can be either landline or wireless and has 30 hours of backup battery. GoSafe is a mobile option for those who regularly leave home. The GoSafe pendant (with AutoAlert) has two-way communication so you can talk to the response center when you’re away from home. When you are within range of the base station, however, the pendant will automatically reconnect with it and you will need to talk with the response center through the in-home station instead of the pendant. Unlike the HomeSafe systems, the GoSafe pendant comes with a device fee, a one-year warranty, and a seven-day battery life. It uses GPS and the AT&T wireless network to pinpoint your location, so be sure that the AT&T network is available in your area before purchasing. GoSafe 2 is the newest Philips Lifeline product and the most flexible option. The GoSafe 2 comes with just the pendant and no in-home communicator, and it also has two-way voice communication and fall detection. As with the GoSafe, it relies on the AT&T wireless network, so if that’s not available in your area, this will not work for you. The great advantage of the GoSafe 2 is that it’s your one way of communicating with the response center, even while you’re at home, so you never have to worry about being out of range of the base station. The downside is that the pendant has to be charged every two to three days in order to keep working, and there is an up-front device fee. However, if you are often away from home or if you worry about being out of range of the base communicator, the GoSafe 2 is a great option. In addition to the medical alert system, Philips Lifeline also offers an automated medication dispensing service for $59.95 per month. A caregiver fills the machine and then Philips programs it to dispense small cups of the medication on schedule. (It holds up to 40 days of medicine and can dispense up to six doses per day.) An audible reminder sounds when it’s time to take the medication and then the patient simply pushes a button for the medication to be dispensed. The system tracks missed doses, gives reminders for non-pill medications, and automatically contacts a caregiver when anything unusual occurs. It requires a landline and has 18 hours of backup battery if the power goes out. 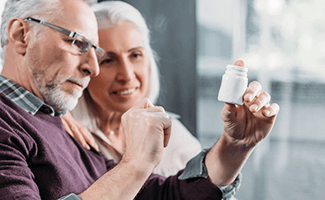 For people who have a complicated medication regimen or simply need help remembering what to take when, this could be a great solution. While we like a lot about the Philips Lifeline system, we were less impressed with the customer service we encountered. Each time we chatted online with a representative, we got long periods without responses, once for a full 10 minutes. It was sometimes difficult to get a direct answer to our questions as well. The reps were quick to ask if we were ready to sign up for the service and also very quick to end the chat—once before we were done asking questions. While we appreciated that we could chat online, we did not enjoy the experience. The majority of online reviews of Philips Lifeline are positive, with consumers citing the rapid response time, positive customer service, and general sense of security as some of the top benefits of having the system in place. Most of the negative reviews mentioned problems with the equipment or not getting the quick response they expected but overall, Philips Lifeline customers are pleased with the service. Philips Lifeline is not one of our top recommended medical alert systems—especially because of the high prices—but it does have some interesting features that could make it a good option. If you need to be able to communicate in a specific language, there’s a good chance Philips Lifeline will be able to help. The month-to-month contracts give you flexibility if you know you won’t need the system for an extended period of time. If you don’t want to worry about being in range of an in-home base station or if you lead an active life, the GoSafe or GoSafe 2 packages might be just what you’re looking for. Ultimately, it depends on the needs of you and your family. What are your experiences with Philips Lifeline? Share your thoughts with us in the comments.